purple lilacs and an orchid, originally uploaded by sokolokophoto. The name “Madagascar” brings to mind notes such as ylang ylang, geranium and vanilla (the only real orchid used in perfumery). And so, I was expecting vanilla from Lisa Hoffman's Madagascar Orchid. Instead, I got lilac. Nestled in a pebbled-green, soft leather travel pouch were four little roll-on bottles with a golden cap. The “Variations” took me by surprise when each one of the four bottles turned out to contain a different scent – each one a variation on the theme, made to fit a certain moment during the day: morning, daytime, evening and bedtime. Interesting concept, with some practical implications: The nose does get tired if you wear the exact same fragrance all day, and the olfactory bulb does goes through different degrees of sensitivity throughout the day. It is also particularly fun for perfumistas, who enjoy exercising their refined sense of smell by comparing the subtleties between each variation. And lastly, it is definitely much cleverer than the flankers we see popping out only several months after the “original” scent comes out (usually it won’t be original at all). The morning variation would be light and not overpowering, as to not overwhelm you before you had your coffee; the daytime variation seems quite strong, and I have a feeling it is going to come handy as a pick-me-up scent when the energy goes down in the afternoon; the evening is the most sultry and rich of the four; and lastly the bedtime variation is soft and a little powdery, to help you wind-down and drift into sleep. The Madagascar Orchid Morning variation is quite soapy, but also dewy and a little crisp, like what you’d smell on a cluster of lilacs early in the morning, with hints of crushed green leaves in the garden. The Daytime variation is a little more full-bodied, but still within the fresh light floral realm. The lilac note in here is quite pronounced but with a bit of powder and sweet notes as a backdrop. It took me a while to figure it out, but it really did remind me of the lilac-scented deodorant I got when traveling in Quebec 12 years ago, which brought me some fond memories. The Bedtime variation is more delicate but my least favourite. It’s not as floral, and a even more powdery than the previous two. I think I can smell lavender in there. The Evening variation is distinctively different, with warm, sweet notes of incense crawling from beneath. It was the first one I gravitated towards, and it’s the only one in the collection that really could remind me of an exotic orchid. It does not have much of the lilac as in the other ones, but instead, has a scent reminiscent of the East Indian “Night Queen” perfume, and with trails of sweet incense smoke swirling around it. Personally, I enjoyed the Evening variation more then the rest, which is not surprising at all considering that I usually gravitate towards the heavier scents. The contrast between the smoky incense and the heady flowers is mediated by a tad of sweetness (perhaps vanilla) yet never sugary sweet. Like I said the other day – it makes for a perfect fall floral scent. 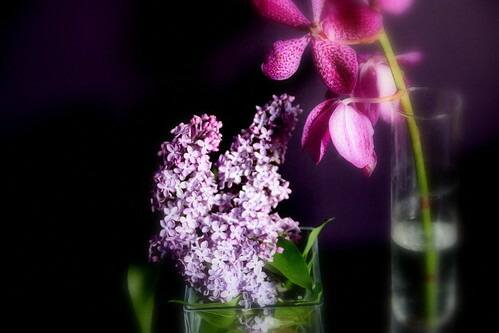 Orchids are usually "fantasy florals" - a composition made of several different notes (natural and/or synthetic). Sometimes they are completely "made up" from the perfumer's imaginations; other times they are captured using headspace technique from exotic orchids in faraway lands. In other words - what perfumers call "orchid" could smell like anything or like nothing else. This particular orchid perfume is both exotic and intoxicating and whether it smells like a particular orchid or like something familiar from my daily life is not important; but the fact that it creates the sensation of a fragrant blooming orchid. The "official" notes for the Madagascar Orchid collection are: sheer jasmine, ylang dew, mimosa mood, and pink peony. Another interesting thing to note is the medium for this collection: the base for these roll-on perfumes is made of a mixture of nut and seed oils such as sesame seed oil, rice bran oil, macademia nut oil, brazil nut oil, acai pulp oil, jojoba esters, squalane oil and vitamin E.
Effective until October 15th: enter LHB4DC to receive a 35% discount on all orders. And until the end of the month (October 31st), SmellyBlog readers can enjoy a 15% discount on all Lisa Hoffman products with the coupon code SMELLYBLOG. Fall Flowers, originally uploaded by DHamp1. Flowers in autumn are perhaps more groundbreaking than in springtime...The weather in Vancouver has been unusually warm for the season, which could be the reason why I am gravitating towards opulent florals. 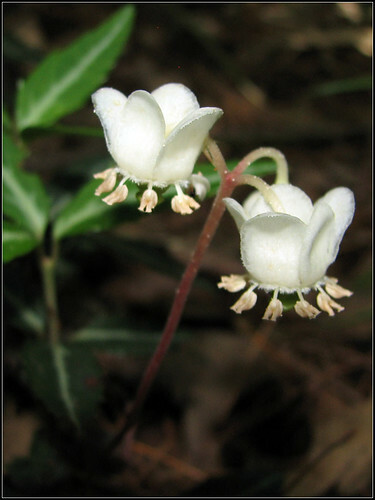 The elegant whiteness of these lush petals is set against a dark layer of brown, ambery labdanum. The gardenia notes are a little like tea (or maybe it’s because that the first time I worn it was for an afternoon tea?). A true love. And finally I indulged in a full bottle that should last me the whole winter (at least). I’m particularly smitten with the Evening variation, which smells of night queen, lilac, and incense. Rich and soft yet easy to wear. And speaking of night queen, this one smells just like it. This soft, sweet rendition of tuberose, with notes of violet, rose, wild clover, amber and incense with a hint of oiliness to it that makes it seem as friendly as a Danish butter cookie. Macarons don’t travel well, but perfume does. And my New Yorker friend Nancy was right when she described this to me as “violet macarons”. I learned what Farnesiana smells on that visit three summers ago; but didn’t learn what true violet macarons are till this May. Now that I know both, I’d say that Farnesiana is like cassie and violet macarons (cassie being a richer, more violety type of mimosa), sweetened by heliotropin. For those who enjoyed the almond and rice-steam aspect of the original, this is a real treat, because it takes this abstract synthetic floral into the realm or a really easy to wear comfort scent, with some of the sharpness of the original rounded off. I’m am particularly enjoying this these days layered with L’Occitane’s Almond Milk Concetrate. This number is making a comeback in my wardrobe, after a pretty long break. I’m really enjoying it these last few days, applied with very light hand. It’s comforting, soft and both floral and musky. I find this combination to be both grounding and uplifting for me. Opulent like a pearl steeped in milk-tea. Bois des Îles is something I only wear when that special mood strikes. It could never be an everyday scent for me. It is just too special for that. I’m amazed at the rare combination of creamy woods and warm spice with just the right amount of floral and aldehydic notes to make it shimmer and diffuse like the soft-focus surface of that pearl. You're invited to join my new network on Ning.com. I'm hoping you could find new friends there, as well as be able to share some ideas you have about things you like to see/smell from Ayala Moriel in the future. (No, it's not a focus group, but I would really love to know what you think!). It's been busy couple of weeks for me, teaching perfumery for 6 days straight here at my studio. But obviously there is no rest for the wicked, and I will be at Porotbello West all day today, so this is just a quick reminder to the locals among you (local meaning Vancouver BC area...) and hopefully you will be able to make it here! There are more details about how to get there here and on other participating vendors there. And if you miss this market, the next one is October 25th. Portobello West occurs on the last Sunday of every month, except in November, December and March it's a full weekend market, both Saturday & Sunday - meaning even less rest than none (for the wicked, that is). The only special thing today is that I will be bringing my chai incense cones for sale, an experimental batch so the price will be an introductory one. See you soon! This week is filled with the intensive week for the new natural perfumery course students. I wish I'd have time to post, but it's highly unlikely. Hope to be able to post again next Monday at the latest. My dear SmellyBlog readers, I wish you a very sweet and good year to come! The end of the old one is tonight, and the new year begins tomorrow night. May we all find the little buds of pomegranate blossoms to brighten up our tree-of-life and promise fruit full of seeds and good deeds. In each seed is the potential and power for change. The Art of Perfumed Candlemaking at with Nikki Sherritt, the very same who makes Ayala Moriel's exclusive candle line will teach you how to make your own naturally scented candles using soy wax and pure essential oils. You will take home with you a travel size candle to call your own. Fee: $100 (materials included). There are spaces in both workshops, so sign up now if you wish to participate simply by emailing or calling Ayala at 778-863-0806. You may also book your own private workshop - visit here for more workshops available (maximum group size: 6 people). The Foundation of Natural Perfumery Course Handbook is now available for the wide public, not only my students attending the 2 year course. This second edition is an alternative to my now-discontinued correspondence course. This 110 paged book is filled with a wealth of information, including new chapters that were not in the first edition - such as Problem Solving and Troubleshooting, Formulas and Recipes, lists of materials, tools, supplies and suppliers, as well as many new exercises that will help you study the art and science of natural perfumery on your own pace. *If you choose to sign up for the course in the future, this will be deducted from your tuition fees. ** Regular price $550, now on special until the end of September - for $475. What are the differences between an aromatherapy synergy and a natural perfume? How is a natural perfume constructed? How to sniff like a perfumer? These topics, as well as olfaction and perfume genealogy, will be explored through hands-on examples and experiencing both familiar and new essences with this fresh perspective. * Attendees will receive 6 CE credits for this event. 09.09.2009: Vancouver, BC. Ayala Moriel release The Purple Dress, a chromatic perfume that blurs the lines between soliflore and oriental. A salute to Alexander (Sasha) Argov's famous song, The Purple Dress is just as romantic in a chromatic, nocturnal, off-beat way. Champaca flowers from India are the main theme of this spicy, floral tea-like composition, supported only by hints of white magnolia and star anise, and a foundation of black tea and smoky woods. *Offered in Parfum Extrait 9ml flacon ($160) and Crème Parfum in Ayala Moriel’s Signature Peprfumed Pendant ($150). Only 12 bottles and 4 pendants are available. Invitation to The Purple Dress Launch Party (December 12, 2009) as well as additional images and samples are available upon request. As you can see, the basic travel kit differs only slightly from the basic care kit. It includes lavender, peppermint, geranium, chamomile, ginger, eucalyptus, thyme and citronella or lemongrass. The main changes are the omission of cloves and lemon; the addition of ginger oil for it’s aid in upset tummy and nausea; sand citronella (or lemongrass) for their excellent mosquito and insect repellent properties; and replacing the tea tree oil with eucalyptus, which I suppose was done because of eucalyptus’ similar properties to tea tree in some regards (i.e. : help with colds and coughs) plus it has the ability to help with sunstrokes and sunburns, which can definitely come handy if you’re traveling to the hot places in the world (which I usually do). I suppose the cloves was taken off the list based on the assumption that one has taken a good care of their teeth before embarking on their journey. The “Emergency Reference Chart” on p. 58-60 is really helpful: it gives you many unpleasant situations and the oils that can be used to alleviate the little discomforts or at least be used as a first aid until you get medical help. This kit covers pretty much anything from headache and nausea on the plane to jet lag after landing as well as protection against catching all kinds of bugs on the way. And of course many little tips for how to combat the little discomforts of travel, from insect bites to upset tummy to sunstroke and sunburns. And just as before with the basic care kit, you must remember that each oil is used differently for different scenarios and conditions. There are many ways to use essential oils - in compresses, baths, steam inhalations, diffused into the air, in massages (added to oil, usually), and only in very rare cases are they ingested or applied neat on the skin. Each ailment calls for a different oil or combination of oils and different method to administer them. It's important to follow the formulas instructions carefully as overdose of essential oil or a wrong method of administering them may be counter effective. Oils work gently on the body when used properly; but they are highly concentrated compounds and should be used with much care and respect for their precious power. Keep in mind that each drop may represent as much as a kilo of plants that were distilled! On this note, I've left my kit back home with my family, and I'm preparing them a collection of index cards with recipes and formulas that I think will come handy. In Hebrew, of course. Continuing on with Valerie Ann Worwoods' aromatherapy kits - starting with the basic care kit she suggests every home will have, as a sort of an aromatic "first aid" kit - not to replace but to complement the usual array of band aids, gauze, emergency blanket etc. Excellent for healing burns, an antiseptic and can be used neatly on the skin to treat cuts, bites, wounds, etc. as it "promotes healing and prevents scaring" (p. 20) and also aids digestion. It also alleviates headaches, and has a positive effect on the mind in emotional situations such as shock, depression and anxiety and helps to get a good night's rest. A highly effective non-poisonous antiseptic that takes care of all three types of infections: virus, bacteria and fungi. Really excellent for treating a variety of ailments, including yeast infections and fungi, acne, toothache, sunburn and more. Most known for its help in digestion problems and nausea, treating headache and migraines and aiding the respiratory system. It also helps in flu, toothache, fatigue and keeping pests away, including mice and ants. Known first and foremost for its calming and anti-inflammatory properties, for both joint pain and various skin conditions (eczema, psoriasis, sensitive skin...). It's excellent for calming babies and children, and also soothing teething babies or ones who suffer from colic and diarrhea. Extremely versatile oil, eucalyptus is an anti-inflammatory, antiseptic and antiviral and helps with many different conditions, including chest and head colds, sinusitis, coughs, etc. It also has deodorizing properties and helps cool-off in the summer as well as used as an insect repellent. Rose geranium not only smells wonderful, it also has marvelous therapeutic benefits. It is a nerve tonic and a sedative; helps women in menopause and with uterine problems (i.e. : endometriosis)and is a wonderful addition to skin care products as it rejuvenates the skin and can “make chilblains disappear overnight” (p. 21). Stimulates the body and the brain, and helps in treating aching muscles, arthritis, sprains, etc. It also helps the memory and cure headaches; and being an antiseptic it is great for coughs and flu. It is a wonderful addition to haircare products, strengthening the keeping the sculp clean, as well as help combat acne and oily skin. Thyme is a very potent oil and should be used very carefully. Some thymes are safer to use – i.e. s Thyme ct. linalool (the only kind that can be used for children). It is a very powerful antiviral oil, and also antiseptic, antibiotic and diuretic. When used to scent the room (i.e. : in a diffuser), it can help keep colds away during the winter time. It can also help the body cleanse itself from toxins. And it is particularly helpful in keeping insects and parasites away. Should always be diluted before use on the skin. While lemon is very much loved for its flavour and aroma in foods, it is particularly effective when added to synenrgies. It can be added to many synerngies, including treating insect bites, cellulite and slimming potions, reducing headaches, getting rid of planter warts, and in wrinkles-reducing skin care. Famous for its analgesic properties at the dentist, clove oil is not just for alleviating toothaches; but also helps to prevents diseases and infections. Also a very potent oil that can easily irritate the skin and should always be diluted before applying to the skin. Disinfectant and also helps with digestion and muscular problems. With all that being said, it's important to stress that each oil is used differently for different scenarios and conditions. One can't assume that all oils would be used the same way for all ailments. There are many ways to use essential oils - in compresses, baths, steam inhalations, diffused into the air, in massages (added to oil, usually), and only in very rare cases are they ingested or applied neat on the skin. The book offers many recipes and formulas for synergies for various first aid scenarios, including abdominal pain, abscesses, athlete's foot, burns, catarrh, coughs, constpiation, fever, headache, insect bites, sinusites, sties, tothaches, etc. It's important to follow the instructions carefully as overdose of essential oil may be counter effective. Oils work gently on the body when used properly; but they are highly concentrated compounds and should be used with much care and respect for their precious power. Keep in mind that each drop may represent as much as a kilo of plants that were distilled! Read Trish Vawter's review of The Purple Dress on Scent Hive. The Purple Dress is my upcoming perfume this winter, inspired by Sasha Argov song "HaSimla HaSegula" (The Purple Dress). You can hear the full song below, as it sung by the talented gidi Gov and Netanella. Joining the celebrity scent craze is Jamie Olivler, aka The Naked Chef, who is launching not just one scent but an entire line titled Scent and Savour designed by British perfumer Bella Crane of Bella Blissima. The Scent and Savour line is already posted on Jamie Oliver's website, without much information about it. But we do know it will include the Naked Chef's very own 4 (yes, four!) Eaux de Parfum, so that he would at least be wearing a fragrance even when caught seemingly naked; a bunch of products for the body (bath milks, soap on the rope, body washes, body milks, etc.) AND home fragrances (i.e. : reed diffusers, candles and room sprays). The website says absolutely nothing about what these will smells like, therefore leaving it to our imagination whether it is going to smell like "The Easiest, Sexiest Salad in the World'" (notes of fig, parma ham and fresh greens and basil), "Whole Roasted Salmon Wrapped in Herbs and Newspaper" (notes of salmon, paper, ink, black pepper, fennel and sea salt) or "Pukka Pineapple with Bashed-up Mint Sugar" (notes of pineapple, mint, and yogurt). Alternatively, the scents might very possibly named "Poppy Honey Rosie", "Daisy Boo Pamela" and "Petal Blossom Rainbow" (the names of the chef's three daughters). But we can only wonder what the 4th one might be? Either way, this is probably the most exciting fragrance launch I've seen in a while, celebrity or not, and I can only hope they won't disappoint! My disappearance from SmellyBlog these past few weeks coincided with my appearance elsewhere on the globe attending to some urgent family matters that needed my full attention (and still occupy a good chunk of it regardless of my return). It was a terrible trip, and save for my one trip to the beach, one prickly pear harvest and reunion with my family (including a brand-new family member, aka my first ever niece) I would have preferred to write-off the entire visit and pretend it never happened. One thing that helped me somewhat to go through this horrendous visit was this collection of essential oils I've taken with me, in part to assist the usual woes of air travel, followed by the usual midsummer insect attack I experience whenever in the country side, and in part with hopes to relieve some pain and discomfort to a sick family member who was the sole purpose of this unwanted adventure. The family member in question was in a way worse situation that any essential oil can redeem. And so I only used the oils on that person once, in a gentle massage of lavender and a hint of bourbon vetiver, to slightly stimulate their dying nerves. The bourbon vetiver with lavender was beautiful - not unlike the magic that happens when lavender meets spices. I guess there is something spicy about this partiular vetiver variety. So much so, that now that I'm back I'm set to work on a little experimental lavender-vetiver perfume. The rest of the oils were used mostly to help us all fall asleep - lavender and chamomile drops were sprinkled on our pillows to help us get some rest. Geranium and lemongrass (as well as the lavender) were mostly utilized to keep away the biting insects and what have you. The presence of these oils is probably the only reason I was able to get any sleep on this trip and get out of it alive. Lavender oil also does wonders to the insect bites that weren't prevented. It make the itch go away in an instant. And than there was tea tree - which I used for various summer rashes and is great for combating all three microscopic disasters: fungi, bacteria and virus! It also can be used in the hospital (even on the bed) to keep away all three from the patient's bed, and prevent additional infections that are unfortunately so common in hospitals. On the following few posts I will be talking about the two basic aromatherapy kits suggested by Valerie Ann Worwood in her book Complete Book Of Essential Oils And Aromatherapy. Fetish is featured on Fragrantica article "Another Birthday? Wear Grapefruit!" by Michelyn Camen. Spotted Wintergreen, originally uploaded by Dave Delay. The other fire element that took me over by surprise was No. 20. Strange combination of notes: ylang ylang, sandalwood, violet leaves and wintergreen creates a haunting illusion of a nasty tuberose that attacks at night. The intense wintegreen opening is bordering on sickening, save for the fruity gardenia deja-vu that occurs when it clashes with ylang ylang’s sweetness and the coolness of violet leaf. Yet, the sandalwood base offers softness and balances this contrasting ensemble with an incense trail, reminding me overall of burning Japanese incense sticks in my balcony in the summertime, when the star-jasmine and gardenias decide to bloom. Like all the Personal Blends from Aveda, one can choose either an alcohol base or an oil base. The alcohol spray bottle releases a heady and highly diffusive aroma, where the notes are more discernible; the oil is softer and sweeter and a little easier to digest since the strong top notes are a little muted. Bowl of basmati rice., originally uploaded by manjidesigns. "The results suggest something profound and interesting about human culture, and that is, we are all hybrids," said McCouch. "Claims of ownership of rice are important for national identity, but people's concepts of national identity are often over-simplified. Humans continuously exchange ideas, technology and everything that is valuable, and in the exchange, they become something new. The lesson is that while each culture and each rice variety represents something unique, much of what we value most is shared by all." From "Reserachers uncover genetic origins of rice fragrance", an interesting article that discovers the genetic origins of fragrant rice, which have implication about the history of rice culture and migration in Asia. 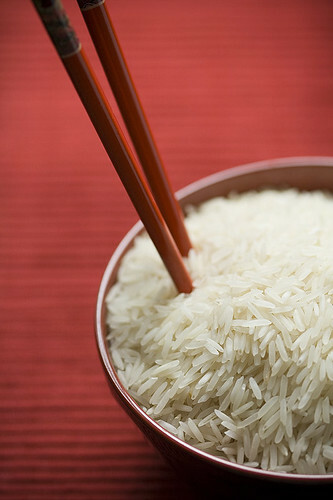 Surprisingly, Basmati rice is closer genetically to Japanese sushi rice than to Thai Jasmine rice! Maybe that would help me convince my boyfriend to eat basmati more often. Being Japanese and all he insists that sticky suchi rice is the best, but I really like basmati better than any other rice - for its texture, flavour and fragrant steam. After The Race, originally uploaded by Ronaldo F Cabuhat. My challenge with Aveda’s scent is experiencing them beyond the spa. Most of the fragrances, as lovely as they are, fail to remind me anything else than a visit to their calmly hair salons. As much as I value their customer service, I rarely need a perfume that reminds me of that. Don’t you agree? The “Personal Blends” line was created for personalizing their unscented line of haircare and body products. I’ve been a long-time devotee of their unscented shampoo and at one time was tempted to go through the 12-piece array of scents. Out of curiousity and without any intention of adding them to the shampoo (I like most of my body and haircare products to be unscented), I gravitated especially to both of their blends titled Key Element Fire (no. 3 and no. 20). Both stood out as more interesting perfumes that evoke something beyond the aromatherapeutic spa experience at the salon. Key Element Fire No. 3 is indeed fiery and spicy. It opens with a slightly grassy note, quickly developing into a warm, sensual mélange of flowers and spices: jasmine, rose, ylang ylang, cinnamon and cloves. The base is a little musky and woody, with vetiver as the dominant note but also a balsamic vanilla base that makes it delicious. I’ve been wearing it a lot this summer, and although it reads like a spicy oriental it is perfect in heat. I enjoy it in the oil base (what is called “Pure Fume Absolute) but you can also get it in an alcohol base in a little purse-size spray bottle. I like the quietness of the oil base for this one, and how it stays close to the skin, which makes it feel more personal to me. It is sensual, grounding, balanced and delicious all at once.